A very cost-effective way to provide overcurrent protection to the entire electrical circuit in your home is to use a Ground Fault Circuit Interrupter (GFCI) circuit breaker. Alternatively, you can buy a combination Arc Fault Circuit Interrupter (AFCI) breaker that has both GFCI and AFCI protection. An arc fault is similar to lightning. It is a highly energized plasma discharge that jumps the air from an energized source to a ground, like you. As the discharge occurs it converts to very high heat and can melt insulation from wires and start fires with surrounding combustible materials. The National Electric Code (NEC) first required arc fault protection in bedrooms effective 2002 (1999 code). In 2014 section 201.12 of the NEC code required new construction to provide Arc Fault Circuit Interrupter protection in kitchens and the laundry room in addition to bedrooms. So the easiest way to provide combined GFCI and AFCI protection is a combination AFCI/GFCI circuit breaker. Below are some links to purchase your AFCI combination breaker and instructions on how to install one of these devices. Purchase a GFCI or AFCI combination breaker of the same amperage rating (e.g., 15 amp or 20 amp) as the one being replaced. Turn the circuit breaker to be replaced in the "OFF" position. Remove it by lifting the breaker from the end closest to the center of the electrical panel and pull it up and out. Remove the wire attached to the other end of the breaker by unscrewing the terminal holding the wire to the breaker. Switch the new GFCI or AFCI combination breaker to the "OFF" position and connect the white pigtail wire to a terminal screw on the neutral bus bar. 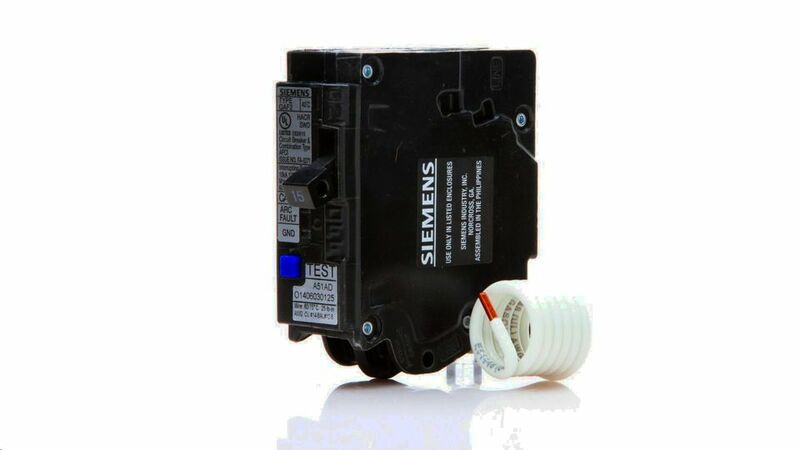 Take the white wire (neutral) for the circuit and connect it to the circuit breaker terminal lug called "load neutral." Take the circuit's black wire (hot) and connect it to the breaker's terminal lug marked "load power." Grab the GFCI or AFCI Combination circuit breaker and at a slight angle hook the base of the breaker into the panel mounting rail/recess. Align the breaker's connection plug on the back of the breaker with the panel's Hot bus bar knife blade and press the breaker breaker into place on the main bus bar. Replace the panel cover, and then turn on the main panel power and turn on the circuit breaker to ensure proper operation. Test the GFCI operation by pressing the "push to test" button on the breaker. The breaker handle should trip and power should shut off to the circuit if it operating properly. Reset the breaker generally by pushing the handle to the far "OFF" position then turn to the "ON" position.